So what were the words that launched a war on America’s currency? “Obviously a weaker dollar is is good for trade,” Mnuchin said. “In the short term, where the dollar is is not a concern of mine and it is not something I spend a lot of time thinking about. There are benefits and there are costs of where the dollar is, depending on which side of the table you are on,” Mnuchin said. Mnuchin was certainly right that his comments in Davos were “balanced and consistent” with his past comments. Back in August, he had said almost exactly the same thing. Those remarks also prompted a sell-off of the dollar. Then, as now, Mnuchin also pointed out that the longer-run trend was for the dollar to go higher because of the strength of the U.S. economy. “In the long term, the dollar’s strength reflects the U.S. economy,” he said in Davos Thursday. It’s not Mnuchin’s comments that are surprising. It’s the ability of Wall Street and journalists covering Mnuchin to continue to be surprised by the them. Insanity is sometimes said to be defined as doing the same thing time and again while expecting different results. Perhaps it is a milder form of mental disorder to keep asking Treasury Secretary Mnuchin the same question about the strength of the dollar and be continually surprised that his answer does not change. Another source of flummox for journalists and Wall Street types is that very few understand the administration’s view of trade, economics, and the role currency plays in both. Too often the administration’s policies are viewed in isolation and through simplistic slogans such as “protectionism.” This leads to analysts wondering why an administration that is pushing for foreign investment in the U.S. would simultaneously weaken the dollar, which lowers the value of profits earned in the U.S. to foreign investors. But as common this kind of point, mumble, and shudder approach might be in reaction to Trump administration actions, it is not very helpful. A bit of analytical thinking reveals the inner-consistency of the administration’s policies. 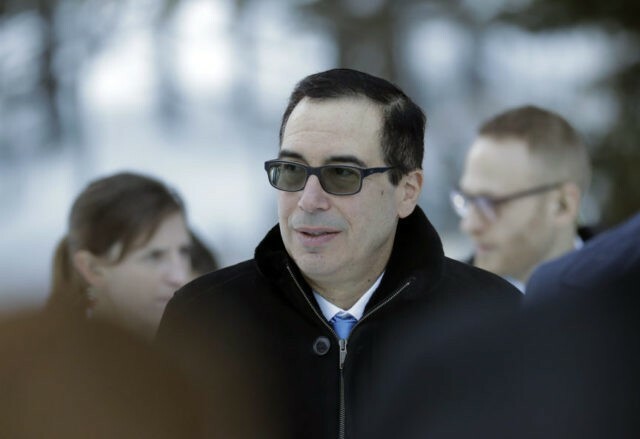 Mnuchin subscribes to the view that the Trump administration’s massive corporate tax cuts, somewhat less massive personal income tax cuts, and far-reaching deregulatory push will accelerate the U.S. economy. This makes the U.S. a very attractive place for foreign investment, as revealed by the recent PwC poll of CEOs who now say the U.S. is by far and away the best place to invest for growth. Enthusiasm about the growth potential for the U.S. economy, however, is likely to strengthen demand for the dollar. That makes U.S. produced goods less competitive, makes foreign goods cheaper, and acts as a brake on economic acceleration. In effect, the benefits of the pro-growth policies of the U.S. get shared with the rest of the world by the mechanism of currency appreciation and direct leakage from rising imports. So what the administration is trying to do with its nonchalance about dollar weakness is to counter this tendency of exchange rate fluctuations to spread rising U.S. wealth across the globe. There’s also a peculiar–and widely overlooked–feature of foreign investment in the U.S. that makes a weak dollar policy attractive to the Trump administration. Although many foreign-owned manufacturers have plants in the U.S., many of those still import intermediate goods and parts from their home countries or developing nation manufacturing bases. Dollar weakness versus foreign currencies makes these arrangements less profitable, encouraging companies to locate more and more of the manufacturing process in the U.S. This effect is bolstered by the fact that the administration can credibly threaten trade sanctions against nations that run large trade surpluses with the U.S. Given the economic logic of the administration’s stance, it may be that calling its policy a “weak dollar” stance is a misnomer. After all, the purpose of the policy is to keep a larger share of America’s revived economic greatness at home. Let’s just call it an “America first” dollar policy.